‘The interval method from hell’ – that is how Stuart Dangerfield described a particular set of pyramid interval training sessions, designed by Gordon Wright. However, although very intense, it helped Stuart Dangerfield to a string of successes at domestic short distance time trialling. 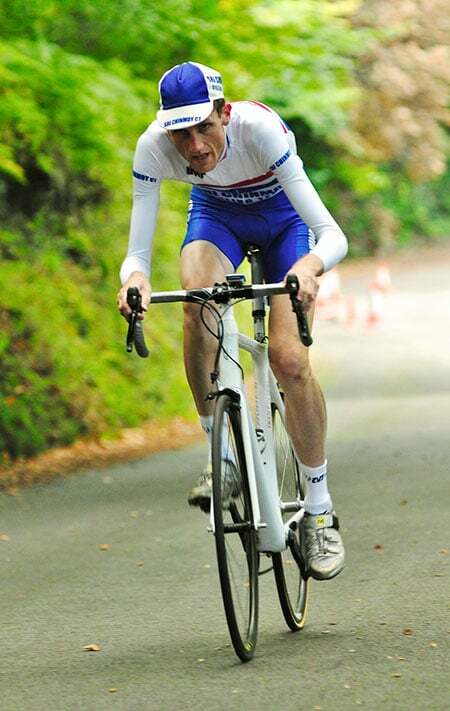 His achievements included lowering the competition record for 10 mile TT to 18.19, plus several national championships from 5 hill climb championship to the 10 mile and 25 mile TT champs. 8-10 flat out sprints for 15 sec. At least 3 mins recovery between each. Between 6-10 flat out 1 minute intervals. 5-6 mins of recovery between each. 3-4 2.5 mile endurance intervals (around 5 mins) at 10 mile TT pace or higher if poss. Stay well-hydrated and use energy drink. The whole session will take 2.5 to 3 hours. The idea is to go fast. Ride with wind behind on endurance intervals – get used to riding at race pace. Obviously, this high level of intensity training requires a very good base of fitness to start off with. An untrained athlete trying to do this would probably do more harm than good. Gordon Wright said he based his intervals on work by Malcolm Firth during the 1970s. However, the traditional pyramid is to start off with long intervals and work down to shorter ones. Gordon tried reversing the pyramid, so you start off with short intervals and move onto longer efforts. In the 15 second sprints, you recruit the Fast twitch type 11b – these fibres can generate a lot of power, but are quick to fatigue. By having good recovery time between intervals, the aim is to be fresher and do the intervals with less acidosis in the blood (e.g. lactic acid). This enables higher efforts and puts less strain on muscles from working in a more acidic environment. By working different groups, you enable more training effort in a particular session. Empirical evidence suggests that these fast twitch muscle fibres are used during short distance endurance events. Stuart reported a swelling of thighs when making the effort (akin to the pumping iron effect). The whole ride was 105 km, 3.40 hours, average speed 29.4, 1,000 metres of climbing. I sometimes took longer recovery than stipulated. After a 15 minute warm up, I started the sprints. I’m unused to sprinting, and they felt relatively feeble. I’m only riding on feel, but I don’t think I would have been breaking any power meter records. It was also hard work to maintain discipline of maintaining high cadence. Instinctively, I tend to want to mash a big gear when doing any kind of sprint. At the end of this 6*15 second sprint, I was still pretty fresh. There wasn’t much accumulated fatigue. I wouldn’t say it was easy, but it’s only 90 seconds of work. I found it hard sprinting on time trial bike and getting up to max effort. Then I moved on to the one minute intervals, I chose a shortish hill. Rather than do one minute, it’s better to have a physical distance to aim at. The first interval was 55 seconds, the sixth was 61 second. You can time yourself and see how you are fatiguing. The end of the interval on Clare hill even has a white line, used as a prime in a local road race circuit. This makes it nearly ideal, though at the end it gets steeper, requiring a gear change to keep high cadence. After the 4th interval of going up Clare hill, I couldn’t believe who I saw slowly cycling up the hill – Gordon Wright – resplendent in his High Wycombe CC cycling top! That was quite a co-incidence. I did one more interval and then waited at the top to have a short chat to Gordon. It was too much of a co-incidence not to share the fact I was doing the interval session inspired by him. Perhaps if I had seen him on the last endurance hill, I wouldn’t have been so grateful for his interval session! Gordon was doing a long ride in preparation for his first 50 mile TT in 20 years. After a good excuse for a extra long recovery, I went back down hill for the last 2 one minute intervals. The sixth one minute interval was particularly hard, and the time started to drop off. Again, it required a discipline to keep high cadence and make big effort. The biggest challenge in these interval sessions, is to keep motivation to really do all out time trial efforts. It’s easy to back off slightly and not go as fast as you can. The funny thing is that when I saw Gordon Wright on the hill, that interval was really hard and fast. Having someone on the hill to show off to, gives you an added motivation for an extra second. But, when no-one is watching it can be easier to subtly back off. After phase two, I was starting to feel the accumulated effort in the legs, but it was time to cycle off to Aston Hill for phase three. I chose Aston Hill because I knew he physical distance and often timed my efforts up there for many season. My best up the hill is 4.52 – that is at full hill climb pace and obviously when fresh, so I would be able to have a rough estimate of how I was doing compared to my maximum effort. The first interval was hard but, I did 5.25, which isn’t too far off my pb. The second and third were reasonable times. By the fourth interval, my time was down to 6.00 and it felt well below 10 mile TT effort. But, that brought an end to the interval session. I could have done more, but the quality would have really started to drop off. I thought that was a pretty good start for these interval sessions. An interesting thing about doing the five minute endurance intervals at the end, is you feel the ‘spark’ the ‘anearobic’ capacity has been exhausted by the earlier shorter efforts. In that regard you are really relying on and training the aerobic capacity. The other thing is that maintaining a high cadence, you really feel extends your capacity to do high intensity intervals. The temptation is to push a big gear, but then your muscles get tired. Training in high cadence, hopefully enables a more sustained power capacity – it puts more effort on heart and blood supply than relying on muscles. I had a 17 mile ride home, which I took very steady in a high cadence. The day after, Gordon recommends an hour recovery ride at the most. But, to be honest, you don’t really need to be told that. My legs haven’t felt this tired since doing the Buxton Mountain time trial and then riding over to Peaslows hill. I enjoyed the experience. My legs felt more fatigued than usual. The problem is that it will now be mainly recovery rides before National 50 mile TT on Sunday. For very short intervals, using a heart rate is a poor guide to your effort levels. It can be a guide to how you are doing, but bear in mind there will be a time delay and your heart rate can vary due to other factors. A power meter is the best way measuring performance. Some like power meters because it gives them some power to target and helps increase their effort. For 5 minute intervals, he hit 500 watts. During competition 10 record, he held around 460 watts average. In 6 week period leading up to 2001 National 25 mile TT, Stuart did 15 interval sessions of varying length, that’ 2.5 per week. Stuart did a lot of endurance (level 2 training) during the winter months. And would often train 300-350 miles a week. But, from this interval session, it definitely wasn’t just churning out the miles! If you want to have a go, you definitely have to be realistic about state of fitness. It’s really hard. You could start off with half the number 4*15 secs. 4*1 minutes 2*5 mins. Or you could miss out sprint intervals.